Bombers (first performance, BBC, 1971). Bowie debuted the song at his BBC session in June 1971, a performance that’s restrained and tasteful compared with the bizarre studio take, which features doo-wop bassman vocals doubling Trevor Bolder and what may well be Bowie’s all-time-worst studio vocal. Bowie considered putting “Bombers” on Hunky Dory but ultimately cut the track (though it was included an early promo version of the LP). He kicked around the idea of using it on a later record (including a stillborn LP meant to bridge the gap between Hunky Dory and Ziggy Stardust) but finally consigned it to the bottom drawer. First performed at the BBC on 3 June 1971, and recorded between June-August 1971. Finally released on Ryko’s 1990 reissue of Hunky Dory. 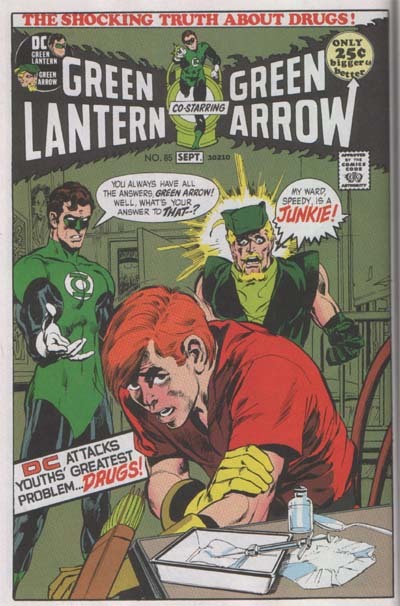 Top: The legendary Green Lantern #85, August-September 1971, “Snowbirds Don’t Fly.” (O’Neil/Adams). This entry was posted on Tuesday, March 9th, 2010 at 9:17 am and is filed under Early RCA Years: 1971-1973. You can follow any responses to this entry through the RSS 2.0 feed. Both comments and pings are currently closed. Sorry, but I really like this song. In fact, I like it so much that if it had always been on Hunky Dory, my favourite DB album, I would have loved the album even more. I like the doo-wop, the daft lyric, the lead vocal, the arrangement, the jauntiness and everything about it. And I love some of those pre-Space Oddity songs from Images, too. Hear hear. I’m a huge fan of Bowie’s more goofy/obnoxious side, and this is a glorious example of that manic glee from Bowie’s “Love You Til Tuesday/We Are Hungry Men” days. I think Bowie’s playfully unrestrained vocals are the main reason why I place Hunky Dory just a tiny bit above Ziggy Stardust. It’s a close call, but those shrieks do it for me. I’ve always loved this too – since handed to me in the school yard in 1983. Waste Land. T S Eliot reference? Certainly Dylan had referenced the poem on Desolation Row. But heck, there was a lot of wasteland in London in 1971. Mostly became NCP car parks. I like the song a lot, but gosh the lead vocal needs rerecorded. I love it for all the reasons I love David Bowie. It’s absurd, zany, bombastic and completely marvelous! I’m sorry it took me so long to discover it. I got intrigued with this song today, after seeing a Hunky Dory acetate being auctioned (estimate 36-48k GBP 😮 ). And now I’m confused. Current auction acetate (with Bombers) – date unknown. I was curious that this acetate is on the Apple label and then found out that the BOWPROMO is an EMI pressing and EMI was the Apple distributor. But why would the BOWPROMO and its acetate be on a label and be pressed by a company that Bowie never used? Were they considering taking him on around Aug 71? I know he was looking for a new contract but thought this was completed with RCA that month. Then I see there is an unofficial US single of London Bye Ta-Ta from 1981 with Bombers on the B-side and noted as from ‘a HD acetate’. But is this really the Ryko version before it was released (so a studio outtake)? Is the unofficial single from 81 an outtake or from the acetate (or something else). Thank you if anyone knows anything about this at all! Absolutely love the chorus for the song…pretty much hate everything else, especially Bowie’s vocals..never cared for high pitch, nut squeeze sounding Bowie. Pity, the song could have turned into something great with more time. I really do like the chorus. If an album was intended between Hunky Dory and Ziggy, it would have made the fastest troika of albums ever! Its not plausible is it? I met Ken Scott (Jap restaurant, London, Classic Album Sunday’s) he said he couldn’t believe it – he’d just finished co-producing his first album – Hunky Dory, and he was walking down the corridor at Trident, when Bowie appeared, and said he was all set to record his next album, – and he didn’t think Ken would like it. It’s hard to imagine tucking an album in between ’em.